As of October 12, 2015, at 03:30:00 PM GMT+8, MEG ranged between PHP4.58 and PHP4.85. MEG’s last price is PHP4.60 with a Percentage Change of -3.16% or -0.15 point(s). MACD, at 0.0692, shows that MEG’s upward momentum is stronger than its downward momentum. RSI, at 57.67, shows that MEG is neither oversold nor overbought. Stochastic, at 80.77, shows that MEG is overbought. MEG has a volatility score of 31.40%. MEG shows bearishness as its last price moves below the 5-day EMA. Volume is 108.64% of the previous trading day. 8 out of 11 active online foreign brokers traded MEG. CREDIT bought the biggest number of shares among online foreign brokers amounting to PHP25,375,900.00. 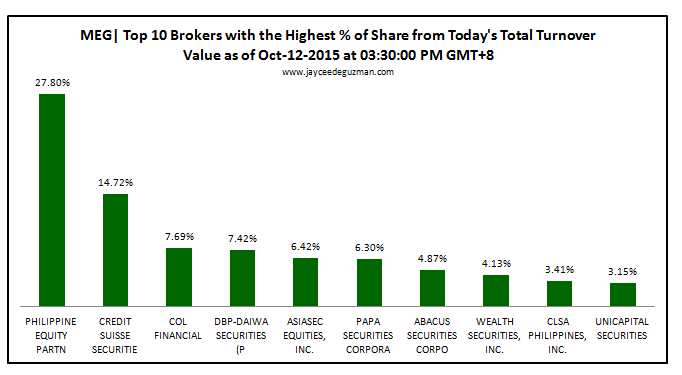 DAIWA sold the biggest number of shares among online foreign brokers amounting to PHP13,032,040.00. On a 30-day trading range, MEG is on a Net Foreign Buying worth PHP53,059,100.00.